For the first time ever, we get to listen to a series of live concert recordings of top American jazz musicians, made at the world-famous Concertgebouw in Amsterdam in the late 1950s! 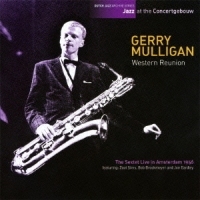 This incredible CD contains a wonderful 1956 concert by Gerry Mulligan's all-star sextet featuring Zoot Sims (ts), Bob Brookmeyer (tb), Jon Eardley (tp), Bill Crow (b) and Dave Bailey (ds). The sound of the four-horn, piano-less sextet (except when Mulligan switches to piano) is unique and fresh even to our ears today. The loose and fun atmosphere is palpable, and the solos by these great musicians are invariably swinging and of high quality. This recording, which captures Mulligan, Sims, Brookmeyer and Eardley in top form in 1956, is an absolute treasure! Recorded at Concertgebouw, Amsterdam on April 7, 1956. The insert contains a full-length liner notes in English and historic photos from the concert.